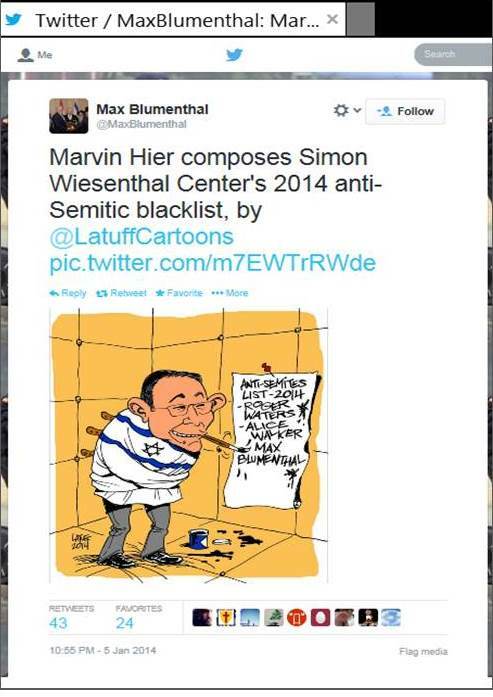 When the Simon Wiesenthal Center (SWC) released its 2013 list of the “Top 10 Anti-Semitic/Anti-Israel Slurs” at the end of December, Max Blumenthal reacted with scorn and ridicule when he found himself included in the category “The Power of the Poison Pen.” As if to prove SWC’s assessment, he posted a drawing by the cartoonist Carlos Latuff, who, for good reason, had himself been included in the SWC list for 2012. According to the SWC, it was his recently published book Goliath: Life and Loathing in Greater Israel and his efforts “to equate Israelis with Nazis” that earned Blumenthal a place on the list. Writing at the Atlantic, Fallows described Blumenthal’s Goliath as a book that “should be discussed and read” and dismissed criticism of Goliath, asserting that it amounted to “flat mischaracterizations” when critics denounced the book as “bigoted propaganda” that is “so anti-Israel it is effectively anti-Semitic.” Fallows also defended the controversial decision to provide Blumenthal with a platform to promote his book at the NAF in early December, arguing that it “was the right call on general free-speech principles” to ignore critics of the event. 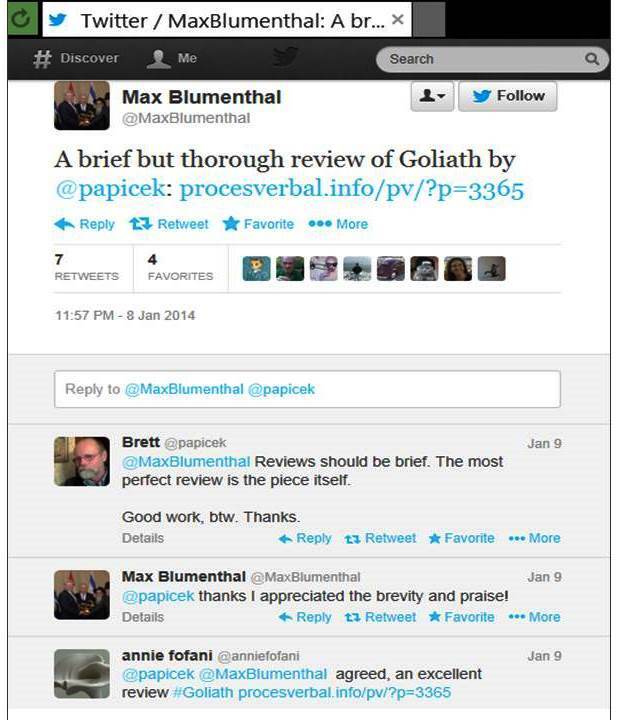 Blumenthal certainly appreciated Fallows’ endorsement and promptly posted an excerpt on his Amazon page for Goliath. But there was another endorsement for Goliath that Blumenthal appreciated greatly – and it arguably makes a fool of Fallows, because it documents that Blumenthal indeed wanted his readers to understand his book as “so anti-Israel” that critics who denounced Goliath as antisemitic can only feel fully vindicated. “You’d think Jews, […] of all people, would react viscerally […] against the notion of their state would [sic] come to create their own Gestapo (Shin Bet), build concentration camp (Ketzlot, for African refugees), emphasize racial purity while demonizing miscegenation (rationalized as the ‘demographic’ problem, but more significantly given religious and racial expression in groups like Lehava), using the police state, not just against enemies, but to crush dissent and ghettos (the walls are sprouting up all over Palestinian towns in the West Bank and, of course, there’s always Gaza). Even Kristallnacht was recreated by what amounts to an officially sanctioned anti-immigrant pogrom in Tel Aviv, in May of 2012. It is often difficult to show antisemitic intent, but Blumenthal makes it easy by endorsing this review – as well as others that offer similar “praise” – thus leaving no doubt how he wanted his book to be understood. Inevitably, this means that Blumenthal and his admirers actually agree with his critics that Goliath presents Israel as an utterly evil state that can only be compared to Nazi Germany. Even though there is considerable controversy about the question when hostility to Israel should be defined as antisemitism, Blumenthal’s single-minded effort to portray Israel in an extremely biased way in order to promote comparisons to Nazi Germany that would justify political campaigns aimed at eliminating the Jewish state qualifies even under the most stringent criteria. In a paper entitled “Another Milestone for the Mainstreaming of Antisemitism: The New America Foundation and Max Blumenthal’s Goliath” that has just been published by the Louis D. Brandeis Center, I have also provided extensive documentation that Blumenthal’s book, or the material he published earlier and then recycled for the book, has been praised on all the major sites popular among conspiracy theorists, Jew-haters, racists and neo-Nazis: from Stormfront to David Duke’s site, Rense, and Veterans Today. 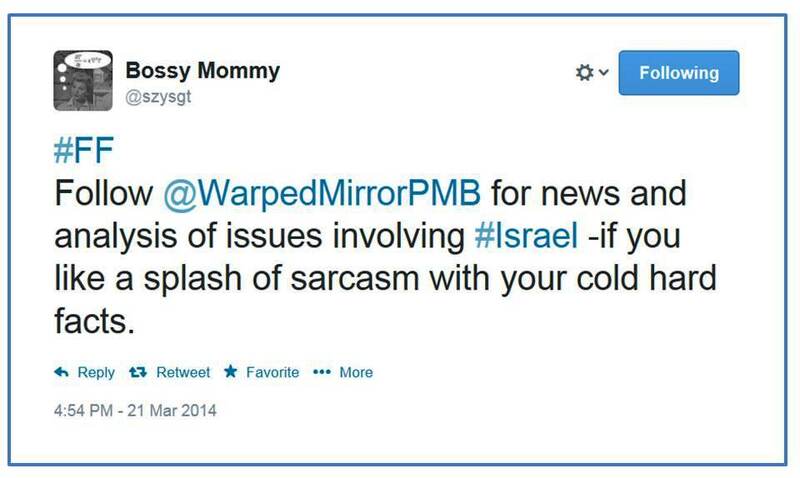 In addition, Goliath was of course celebrated by outlets such as Mondoweiss and the Electronic Intifada, which cater to activists devoted to promoting boycott campaigns against Israel and maligning the Jewish state as illegitimate and uniquely evil. Even if the hate-filled material promoted by these sites is considered “protected” free speech, few would argue that it is a violation of the principles of free speech that mainstream outlets usually shun this material and no respectable think tank would consider featuring it. Fallows noted at the end of his defense of the NAF event for Goliath that if Blumenthal is wrong, “his case should be addressed in specific rather than ruled out of respectable consideration.” That means in effect that Blumenthal’s critics are supposed to make a convincing case that Israel is not like Nazi Germany and that the world’s only Jewish state should perhaps be allowed to continue existing, even if some of its citizens, officials and politicians have views that are no better than those held by reactionaries in Europe or the US. The bigotry inherent in comparing Israel to Nazi Germany has been often demonstrated. Among the most memorable examples is perhaps the 1961 debate at Montreal’s McGill University between the famous British historian Arnold Toynbee and Israel’s ambassador to Canada, Yaacov Herzog. Toynbee had been willing to believe in the 1930s that Hitler had only limited ambitions, but he was alarmed by Zionism, which he considered “demonic.” During a lecture at McGill in January 1961, Toynbee questioned the right of the Jewish people to a state and claimed that Israel’s conduct in the War of Independence was morally equivalent to the Nazis. In the subsequent debate, Herzog forced Toynbee to concede that if Israel’s actions during a war of self-defense justified the comparison to Nazi atrocities, every nation’s conduct in war – and certainly the conduct of the Arabs, who had threatened the fledgling Jewish state with a “war of extermination and momentous massacre” – would have to be denounced in the same terms. 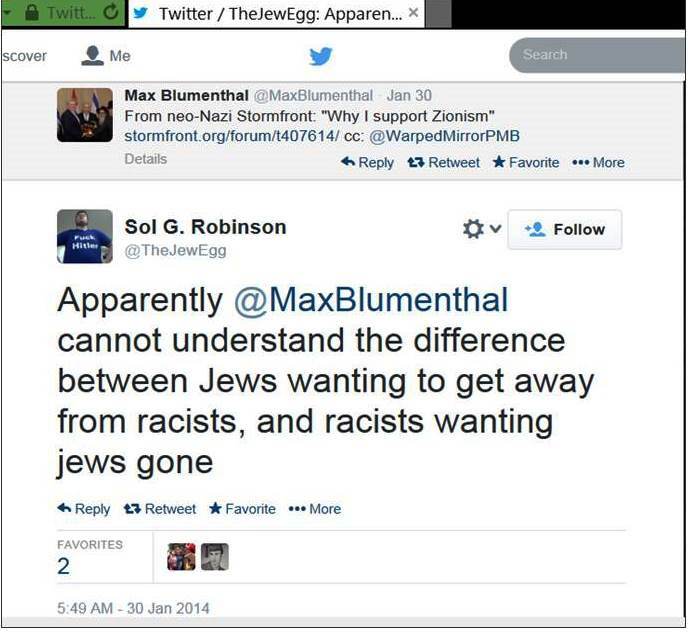 In the post Blumenthal links to, a Stormfront member advances the “controversial and extremely radical proposition” that White Nationalists in Europe and the US should support Zionism and even a “mandatory expulsion of Jews” to Israel in order to reduce the “excessive influence” of Jews “over both the media and economics.” As far as Blumenthal is concerned, this “proves” that anti-Israel activists like him are right to claim that Zionism is not only racism, but also a pernicious form of antisemitism that supports a “Juden raus” policy by establishing and maintaining Israel as a Jewish state. Assuming that Blumenthal really “cannot understand” this difference is arguably the most charitable take, particularly in view of the fact that Blumenthal himself advocated a “Juden raus” policy for those Israeli Jews who would refuse to “become indigenized” in the Arab state that Blumenthal hopes will replace the Jewish state in the not too distant future. To put it bluntly: there is precious little difference between what Stormfront members would like to see happen in Europe and the US and what Max Blumenthal would like to see happen in the Middle East. Marginalizing such views as despicable bigotry that doesn’t deserve to be dignified by serious debate is not a violation of free speech. 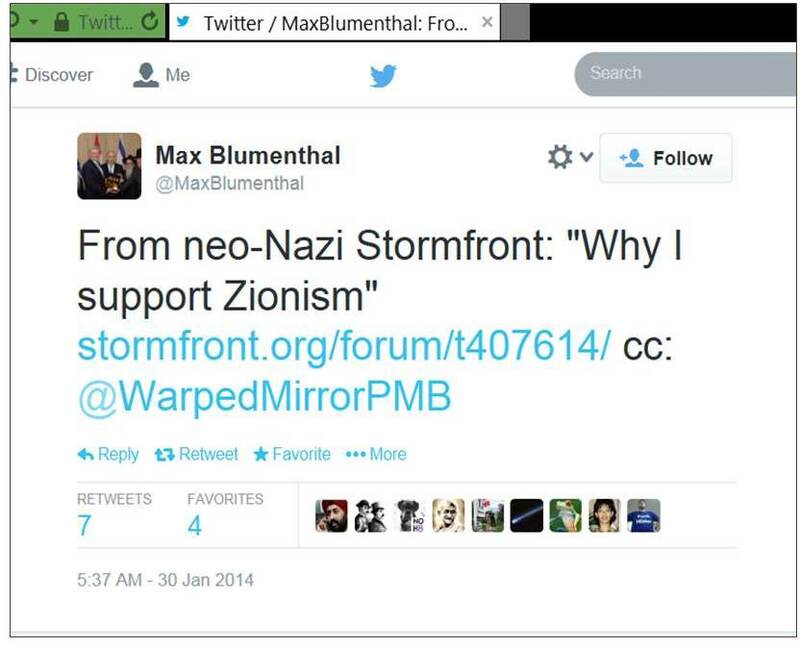 Max Blumenthal may fervently believe that the Middle East’s most democratic and pluralistic state is the Nazi Germany of our time and should be treated accordingly, but anyone who agrees that this is a proposition worthwhile debating would have to explain why other hate-filled bigotries that are popular among Blumenthal’s fans at Stormfront and similar sites are generally not regarded as worthy of debate. First published on my JPost blog and at Harry’s Place. This entry was posted in JPost and tagged anti-Zionism, antisemitism, BDS, Israel, Judith Butler, Max Blumenthal, Mondoweiss, Nazi Germany, Zionism. Bookmark the permalink. “That means in effect that Blumenthal’s critics are supposed to make a convincing case that Israel is not like Nazi Germany and that the world’s only Jewish state should perhaps be allowed to continue existing, even if some of its citizens, officials and politicians have views that are no better than those held by reactionaries in Europe or the US.” Which, of course, is tantamount to proving a negative, by definition, impossible. Further, Petra highlights the “hate-filled material promoted by these sites [David Duke’s site, Mondoweiss, etc]” and raises the point that many will argue that these sites should be “considered “protected” free speech”, but, of course, this goes too far. Freedom has never meant licence, and free speech cannot be extended to those who would use it to curtail everyone else’s free speech. Which is exactly why such people have to hemmed in by laws relating to freedom not to be attacked on the basis of one’s race, ethnicity or creed, etc. Personally, I think I prefer the US approach, because otherwise, political correctness can lead to prohibitions of pretty much everything; e.g. the OIC (Org. of Islamic Countries) has long been pushing for all sorts of prohibitions on “Islamonphobic” speech. One personal loan.diverse issues to make use of charm toward. your objective is consolidating money owed, paying for giant personality events, caring for main purchases neither handling surprising payments. stopping at the common each day amount like aggregte outstanding principal. in days after which multiplied 3sixty five.